At Walt Disney World there is always something happening, somewhere, twenty-four hours a day every day of the year. This means that, occasionally, guests are disrupted. Whether it is a refurbishment of your favorite attraction during your one vacation in years or a crane in the background of your family portrait, it never feels good to have your immersion in the magic violated. Yet, we all know that these are necessary evils to keep the high Disney standard up. 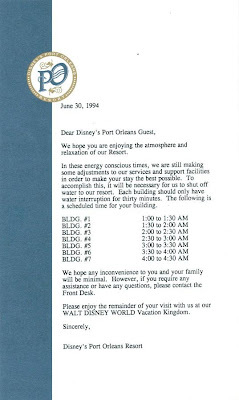 Sometimes these interruptions can even affect the resort room you are staying in, as was the case in June of 1994. Port Orleans had to upgrade some water facilities in order to keep up with their energy conscious Environmentality policies, which required water to be cut off to the guest’s rooms. At least they were courteous enough to give guests some notice and provide assistance when needed.